science is a wonderful subject to admire when you no longer have to sit exams or sleep through lectures, capable of being turned on its head when particularly appropriate, and most likely to do so at the most inappropriate moments. but it generally concurs that if a particularly posited scientific or physiological feature is true in one sense, then also the converse can be true. i'm thinking along the lines of melting ice by the application of heat and the re-formation of same by extracting as much heat as possible from the messy puddle that appears on the desk. of course, this is confounded entirely by the making of such as a sheet of toast: cooling down the latter is unlikely to result in the bread that you popped in the toaster to begin with. several weeks back, my good friend mr james lamont helpfully pointed out that in moments of medium to extreme heat occurring during any normal pedalling situation (less likely as we head further into winter, i'll admit), an ideal way to cool down would be the application of a few drops, or perhaps a veritable flood if conditions demand, to the wrists or forearms, rather than the phloyd method of continually tipping it over your head. having completely unscientifically vouched for the veracity of this ploy, it seems only right and proper that the same methodology be applied in reverse. in other words, if there's an outside possibility of an inherent chill factor, will covering the forearms with cosy warmth result in a more appropriate rise in body temperature than wearing one of those sleeping bags with a zip and legroom (never a good idea in the saddle at anytime)? i have had a pair of these for several weeks now, but rarely had i been presented with such a fine opportunity to become tried and tested than at saturday's braveheart ride in kilmarnock. having set off for scotland with the very worst of weathers in mind (we all remember last year's event), the day itself dawned clear, sunny and far milder than the end of october would have suggested. co-incidentally, this gave me the ideal chance to wear a robert millar anniversary jersey, also procured from endura, and thus be at least partly sartorially matched if only above the waist. as alluded to above, the weather was unseasonably warm, particularly on the outward half of the 20 mile route (around which peter allen - thank you sir - and i chaperoned spartacus hastings), but while the return journey most certainly struggled to fit the description of a headwind, it was a modest few degrees lower than the first ten during which bare arms would have been somewhat of a pose, and likely not one that was too warm. 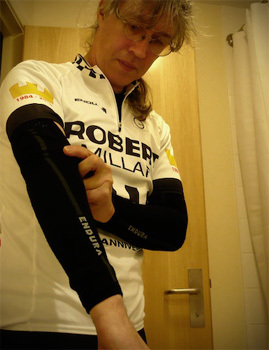 while the baabaa armwarmers are not specifically marked left and right, there is a very real need to adopt a correct dress-code bearing the endura legend facing outwards on each forearm. this has a lot less to do with advertising or political correctness, but more to do with the subtle ribbing about two thirds the way along each warmer to facilitate a gentle bending of the arm without wrinkling (the armwarmer that is, not the arm). at the top of each warmer is a triangle of gloopy dots, intent on creating an appropriate degree of friction twixt merino and polyester (sleeve), thus ensuring that those baabaas remain in place throughout any ride you may choose to undertake. happily this worked just as advertised throughout braveheart and continued so to do in the post ride conversing, munching and slurping. i have not tested their fortitude in the rain, though this was hardly a disappointment during saturday's ride. the armwarmers fit well, with a promising degree of stretch, tempered by impressive integrity that maintained their warming properties both out and back. it is also quite easy to emulate the professional je ne sais quoi, by rolling them down to the wrists for that guess who's got a contract with sky next year insouciant look. of course you could always wear a long sleeve jersey, but that might just mark you out as a winter wuss before your time: nothing says i've had a good season more than a casually worn pair of armwarmers with that all important percentage of woolly retro. endura baabaa merino armwarmers sell for the particularly friendly price of £16.99, are seam free and machine washable. incidentally, if anyone wishes to purchase a robert millar anniversary jersey as seen above, i still have a few left in size large only. cost is £47 including postage, and all proceeds are going to the braveheart fund. e-mail for more details.